Paul Rolly Steve Griffin | The Salt Lake Tribune Sandstone foundations can be seen in the bottom of a trench that was being dug for electrical lines at Fort Douglas on the campus of the University of Utah in Salt Lake City, Thursday, June 18, 2015. The old foundations were the barracks for the fort in the 1800s. For a time, crews were tossing artifacts found during the construction. 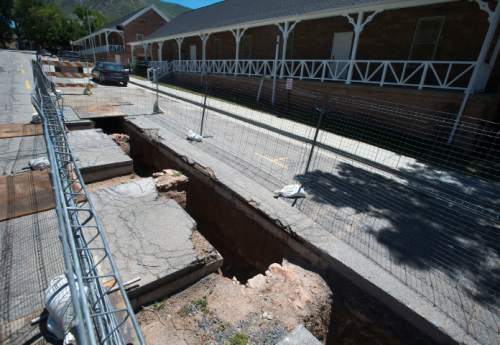 Steve Griffin | The Salt Lake Tribune Sandstone foundations can be seen in the bottom of a trench that was being dug for electrical lines at Fort Douglas on the campus of the University of Utah in Salt Lake City, Thursday, June 18, 2015. The old foundations were the barracks for the fort in the 1800s. For a time, crews were tossing artifacts found during the construction. The University of Utah may be doing penance Saturday during Fort Douglas Day for a boneheaded mistake in its stewardship of protecting this national and state treasure. The sin? Digging up the roads around buildings constructed in 1875 (a year before the Custer massacre), hauling away the dirt and precious artifacts embedded in the soil and dumping it all into a landfill. The U. began the desecration last summer, when crews dug trenches on the east side of the fort, where soldiers first encamped in 1862. Relics are rare from this Civil War era, when the U.S. troops arrived in Utah to guard overland mail routes. The trenching project to upgrade the school&apos;s electrical system encompasses the entire campus, including the historic fort area that the U. has mostly taken over. After the removal of the artifacts began, state and federal officials stepped in to halt the indiscriminate digging. One gem picked out of the rubble: a Civil War infantry emblem worn on Union caps. But even that item had been cut in half by heavy equipment. Despite a bevy of its own archaeologists, the U. broke the law: Section 106 of the National Historic Preservation Act requires agencies to "take into account" how projects will impact historic properties. The site now has an archaeologist, who likely saved stone foundations for barracks built in the mid-1860s. By that time, however, the U. had already dug up a half mile of roads. The school has historic maps showing where work sites, living quarters and other structures were located during the fort&apos;s history, but the information was not considered during some of the trenching work. U. spokeswoman Maria O&apos;Mara said when the project began last summer, an archaeologist was on site, but the work stopped for a while. When it resumed along the road in front of the Fort Douglas Military Museum, a new subcontractor was on the job and started the work without the U.&apos;s knowledge. When museum staffers questioned the subcontractor about possible destruction of valuable artifacts, they were ignored until the State Historic Preservation Office was called and halted the project. While O&apos;Mara said the U. was aware of the need for an archaeologist and had one on site, that wasn&apos;t the case for all of the digging last summer. No artifacts from the area where the soldiers&apos; originally encamped were preserved. After school officials were notified of the destruction, O&apos;Mara said, they sent workers to the landfill to try and recover what they could, but it was too late. "We absolutely acknowledge the mistake," she said, "and we are doing everything we can to make sure it won&apos;t happen again." She said the U. is negotiating a mitigation plan with the museum, which likely will include an outreach plan with signs and interpretive explanations of the historic sites. "Finally, we have white Americans&apos; artifacts destroyed so we have something to really be upset about since the destruction of Native American artifacts hasn&apos;t seemed to receive much outrage," quipped David Irvine, a retired brigadier general and former deputy commander of the 96th Regional Readiness Command at Fort Douglas. On a serious note, he called the destruction tragic. "It is the site of the first federal presence in Utah, and it was home to a diverse group of soldiers," he said. 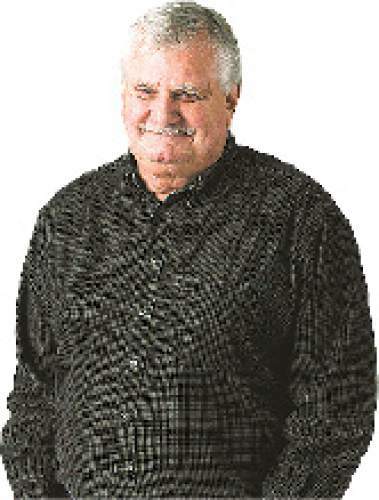 "There were [black] Buffalo Soldiers from the Civil War who were stationed there." Sheri Ellis, the independent archaeologist hired by the U., said that the artifacts can teach us much about the soldiers and the construction of Fort Douglas. "The mortar used in the building foundations can tell you a lot about the daily lives of the people and how they built Fort Douglas," she said. "Also, we can learn what kind of goods the soldiers had access to and where the goods came from. Did they buy from local merchants or did they ship most of what they had in from other areas?" Saturday&apos;s Fort Douglas Day is from 10 a.m. to 2 p.m. Visitors can see military encampments and vintage vehicles from both world wars. They also can tour the fort&apos;s original headquarters, next to where the U. installed an electrical box surrounded on three sides by walls 8 feet high. And, yes, the U. will be there, explaining "special archaeological" displays  the ones that haven&apos;t been destroyed.